i've had this question in my mind for quite some time. let's say u've done the saliva test but it's come out negative. i'm told by a worthy fellow blogger here that one can still have topical fungal issues. # does such fungal bumps itch for sometime?suddenly? so,now am going to focus on fungal folliculitis and it's solution. well, we all know what it is..antidandruff/anti-fungal shampoo like nizoral,scalpe,head & shoulders etc. but my point lies somewhere else. most people i've seen here(including myself) guess it's fungal folliculitis.most aint sure. so,we are asked to give it a go. and most of us do that. # is it safe to use a anti-fungal shampoo on our face(chest/back/body) when it might not be fungal issues at all? will it bother our acne/zits/whiteheads in any way? will it trigger formation of zits/whiteheads/blackheads since it contains harsh chemical(which may dry the skin)? should it be used only on the individual bumps? it's our guess or someone's suggestion that anti-fungal shampoo will help. for which we are thankful..for it really does help many of us who can't possibly imagine the zits/bumps to be anything else but acne vulgaris. but it'd do very good to know the approximate time for them to heal. #so how many days should we go on using the shampoo or lotion to see result? my cousin has bumps and so do i.although she's got more of it. both of us have other zits/whitehead problems and so do many here. so, please share ur experience! i request to be sure before stating facts in this case for this is a matter of safety.and we certainly don't want to worsen any matter. Fungal lesions do itch most of the time. Another reason for an itch could be mites, and a third reason for an itch could be type IV hypersensitivity reaction, which probably has something to do with food sensitivities. It's safe to use an anti-dandruff shampoo on the face. It will likely help normal run of the mill acne, because it has many antimicrobial ingredients, and not just antifungal. Zinc pyrithione, for example, is active against bacteria and fungi. I would put this all over the face. However, I found that using the shampoo for more than a few days gave me contact dermatitis around my mouth, which I attribute to the SLS. I did not get contact dermatitis anywhere else on my face. You could avoid the mouth area if you this you might get contact dermatitis (it's basically just pustules, looks like acne, around the mouth). If your condition is fungal, it would respond within a few days. Less than a week. If you see no improvement within a week, it is likely not fungal. I would apply the shampoo after washing and drying the face, just smear it on and let it sit there like a mask for 15 minutes. The longer you leave it on, the more likely your skin is to get overdried and irritated. 1### Fungal lesions do itch most of the time. 2### Zinc pyrithione, for example, is active against bacteria and fungi. I would put this all over the face. However, I found that using the shampoo for more than a few days gave me contact dermatitis around my mouth, which I attribute to the SLS. I did not get contact dermatitis anywhere else on my face. 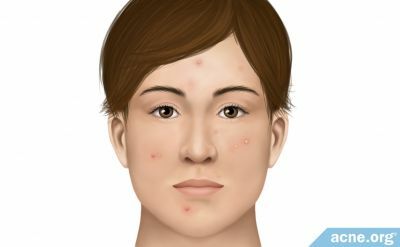 You could avoid the mouth area if you this you might get contact dermatitis (it's basically just pustules, looks like acne, around the mouth). 3### If your condition is fungal, it would respond within a few days. Less than a week. If you see no improvement within a week, it is likely not fungal. I would apply the shampoo after washing and drying the face, just smear it on and let it sit there like a mask for 15 minutes. The longer you leave it on, the more likely your skin is to get overdried and irritated. mine does itch sometimes..i dnt have many many bumps but soemtimes i have these tiny bumps(which either remains there for days or sometimes they just disappear in minutes) but they itch.also some areas other than the bumps..they just itch!without any sign or redness or bump at all. do the fungal bumps have tiny heads like whiteheads?usually? i have both kind of bumps.with and without heads. i have a holiday in 5 days. although there's no mention of SLS i suppose it had it like many other cleanser or hair product. i'd applied it on a few bumps last day and today i lathered up the shampoo on my face except for around my mouth in the shower. i really dnt want acne/pustules around my mouth. and also,i dnt keep it for more than 1-2 minutes as mine isnt a lot. 3# i dnt wanna nag u but are u sure i wont get any side effects? for the holiday and this with it bothers me in combo! btw,nizoral (as far as i know) doesnt have zinc pyrithione. Ketoconazole or zinc pyrithione would probably work, as would selenium sulfide, all of which are found in dandruff shampoos (separately). The shampoo you're using seems like it would work, since it has ketoconazole and zinc pyrithione. In fact, it would probably be better than both Head and Shoulders and Nizoral, since it's basically a combination of the two. 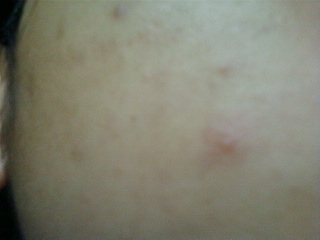 Fungal lesions are often pustular if it's folliculitis, but can also present as bumps under the skin as far as I know. You could wait until after the holiday, but if it works and your condition is fungal, you would probably be clear or see significant improvement within 5 days. The contact dermatitis showed up after I had been using the shampoos on my face for more than a week, so I saw results before the contact dermatitis appeared. Depending on how sensitive your skin is, it could happen sooner or later, and could also happen several days after stopping the treatment (since it's a delayed type IV sensitivity reaction). You might have the dryness side effects, but since you're only leaving it on for 2 minutes, it would probably be only mild at worst. I would try leaving it on (without lathering) for 5 minutes, and see how that treats your skin after a few days. 1stly, i wanna know why only around the mouth? my condition of bumps in terms of numbers or size isnt too bad.so i guess i will give it a rest as of now. the whole idea of contact dermatitis while using it or after i've stopped(which is probably worst) is really really scary. 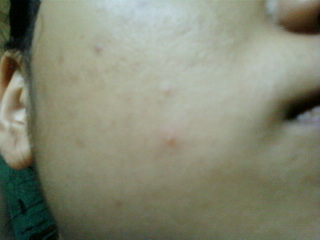 1st day i did spot treatment with the shampoo dots.and nxt i used it around my nose area,cheeks and forehead.lightly. the bumps are suppose to dry up?..they have but am not sure if its the shampoo or clindamycin phosphate gel that i apply twice regularly. i'll stop using the shampoo untill i'm back from the holiday. anyway..i feel i can see whiteheads around my nose..do u think it has to do with the shampoo treatment? 2ndly,i wanted to know if using this treatment will help me in long term? someone said(on the other post) that fungal growth is a chronic thing.i suppose he was talking about internal growth. 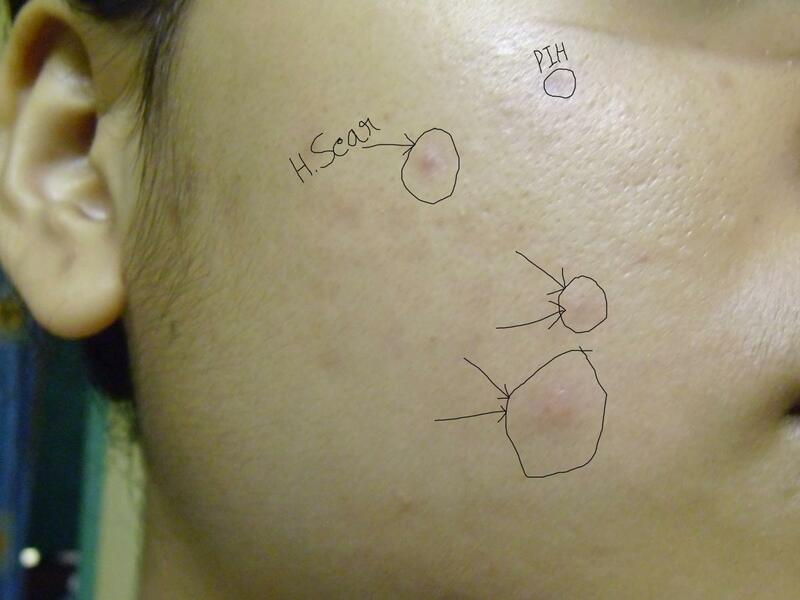 do u think topical fungal folliculitis is a long thingy as well? i really really dnt want that. not only because i've no idea about how to deal with it but also because it will look just as bad as bad acne do. cant that be avoided in any way? i have dermatitis on my scalp as well as hair loss. my doctor prescribed me anti fungal shampoo nizoral. most of my acne is gone after i changed my diet but is their a chance that the dermatitis on my scalp is related to my past acne? is dermatitis a general term but one form of it is from funguses? my acne cleared up big time when i cut out sugar from my diet. is it possible that my acne is related to my scalp dermatitis or fungus? 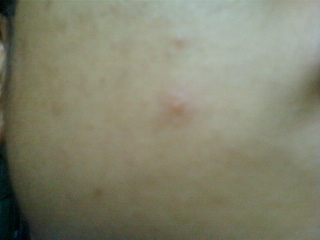 i have got two zits.am not sure if its dermatitis. its tiny(in fact one is way smaller than the other) but they have quite sharp heads and have a halo like redness. here,what do u think it is?